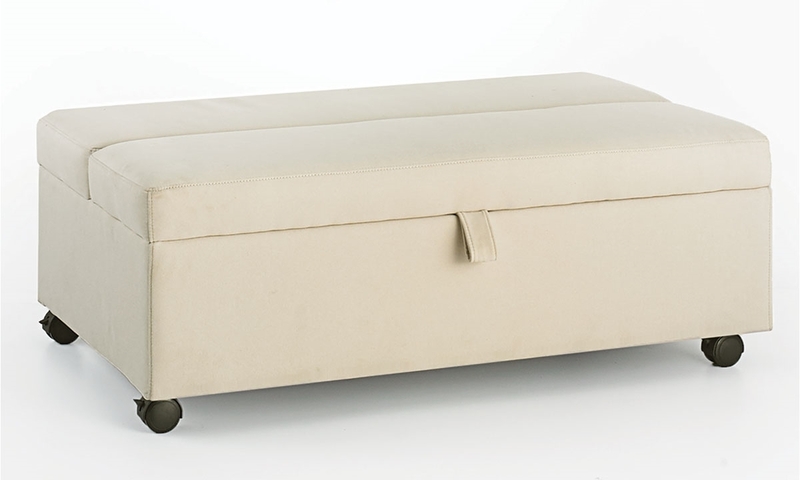 Versatile ottoman with locking casters flaunts worry-free stain resistant fabric, and opens to reveal a twin-size gel foam mattress. Whether you’ve got a full house or a smaller apartment, this sleeper ottoman will be the space-saving star of your living room! Upholstered in cream LiveSmart fabric, this four-foot-wide piece easily repels stains to allow for worry-free use as a footstool or upholstered cocktail table. When it comes time to settle down for the night, the top opens to reveal a twin-size gel foam mattress inside. You’ll never have to deal with the hassle of moving furniture out of the way thanks to the locking casters on the bottom of this sleeper ottoman, making it easy to reposition in an open space in your home. Kick back or lie down with this ottoman upholstered in breezy blue stain resistant fabric, featuring a twin-size gel foam mattress. 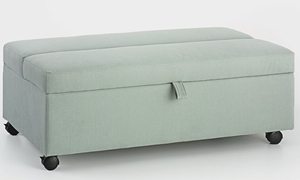 Ottoman with casters is upholstered in gray stain resistant fabric, and features a twin-size gel foam mattress inside.